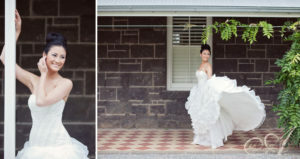 My vision for a bride on her wedding day is always something that enhances her natural beauty. 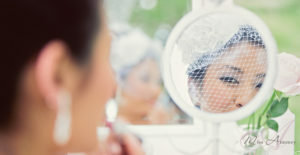 I believe that make up and hair for your special day shouldn’t overshadow your natural beauty but instead make you feel at your most beautiful by enhancing your best features and allowing your happiness to shine through. 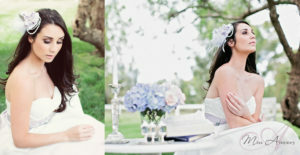 I wanted to recreate a photoshoot that matched the emotions that a bride goes through the morning of her wedding. It’s always such a fun, nerve wracking and exciting period before she walks down the aisle. 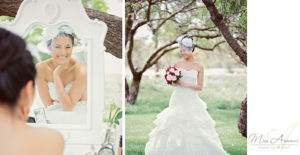 Every bride that I’ve had the pleasure of working with has been such a delight and I just wanted to portray that in this shoot as I’m so excited for 2012 and all the brides I will be lucky enough to meet. As soon at the idea popped into my mind, the first people I contacted were Couturing as they are the most amazing stylists and we seem to always share the same vision. Thom worked on the shoot with me and was amazing through it all helping me complete the long list of things I needed to gather for the shoot. Finessence seemed to be the perfect photographers for my the shoot because in a nutshell, their photos are always perfect. 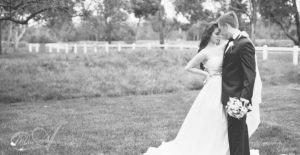 When I look through their wedding pictures they make me laugh and cry because they capture the day perfectly. I adore Karen’s vision as it’s basically the same as mine only I could never take a picture as beautiful as she does. I was lucky enough to also have Jayden (Alan & Karen’s most adorable son) on the shoot too! Stephanie Mizzi created all the beautiful head pieces for the shoot and she can custom make just about any accessory for your special occasion. She’s also a gem to work with! The beautiful and perfect looking models Julie Wynn and Penny Hagekyriakou featured were flawless and battled the wind, cold and constant touch up and direction to get the most perfect shots. Thank you for your dedication to the day. Julie, you know that you are the wheels on this journey of mine. Domain flowers donated all the beautiful bouquets featured. All bouquets were amaing! One of my favourites actually featured some strawberries and another, mushrooms! Domain were so creative and generous and really made the whole scene complete. Gwendolynne and Cathleen Jia were so lovely and generous to donate their amazing evening gowns. 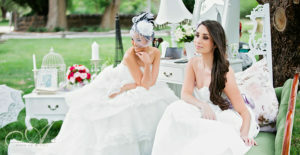 As well as Wittner for allowing us to borrow the beautiful bridal shoes featured. Special thanks to Violetta bridal who lent us all the wedding dresses, jewllery, furniture and gave so much of their time into helping make the whole shoot possible. The ladies there Rosa, Tiffany and Rosa are amazing! Eynesbury Golf Course was where all the photos were shot. Thank you to the styling assitants for the day April(arrangement of flowers) and Suzie (making the delicious biscuits), without your tireless efforts I could not have been able to put together the whole shoot. And finally, thank you to my amazing partner who is not only my biggest supporter but the reason why I am living my dream and continually inspired to be better in everything I do. Thank you again to everyone who helped me with this shoot because it is my dream realised. Your efforts did not go unnoticed and my heart is filled with gratitude and appreciation. I am so blessed and hope this shoot brought a smile to your face and brightened up your day as much as it did for me.